Low Veg Glycemic Index Recipes, Indian Veg low GI recipes. When you see a lean or fit person, you know that they have understood what food does to the human body. Its not a fluke. Over many years, they have eaten correctly and more important they have exercised on a regular basis. That takes us to the issue of correct eating. We will explain the best Indian foods to have in your low GI Veg diet and present you with a list of Healthy Recipes. Well, for one, the glycemic index isn't just some random diabetic diet you can find online or in a book somewhere. It's actually a scientific system to deal with your blood sugar levels. Always keep in mind that spikes in the body sugar levels can be devastating for health! Basically the glycemic index ranks carbohydrates on a scale of 0 to 100, and it's based on how they can raise your blood sugar levels after you eat. Foods with a higher GI level are digested faster, and therefore create a spike in your blood sugar levels. However, foods with a lower ranking are digested much slower. This allows the sugars to gradually be introduced in the body, and that means no spiking of the levels. What is Low Glycemic Index Food? A food with a glycemic index of less than 55 is considered a Low Glycemic food while 56 to 69 is Moderate and over 70 is considered High. Most of the vegetables, dals and legumes, nuts, oilseeds, milk and products and some fruits are relatively low on GI. As far as possible, try and eat home based food. You know what you are cooking and over time it is common sense of what to have and what not to. The biggest culprit is SUGAR which creates major inflammation in the body once its consumed and will raise your blood sugar rapidly and shut down your fat burning. The other obvious things to avoid are cornflour, maida and potatoes. Most packaged food has hidden ingredients like fructose corn syrup which is nothing but hidden sugar and then lots of preservatives which you may have not even heard off. You can make some healthy paratha like Green Pea Paratha with a tasty raita like Pudhina Raita and a cool glass of Chaas for a complete breakfast. We have lots of options availabe at Low Glycemic Index Veg Breakfast Recipes. We can avoid maida and cornflour for our lunch options. Try this Paneer Methi Roti or a Whole Wheat Roti with some the Punjabi favourite Palak Paneer and some Onion Raita. Another interesting option is to try our range of Healthy lunch salads which are a meal by itself. Try this Anitoxidant salad rich in Vitamin C called Kale Masoor Salad. We have lots of options availabe at Low Glycemic Index Veg Lunch Recipes. The base of every Indian dinner is a good Whole Wheat Roti with some good Subzis. Try some Stir Fried Bhindi with Onion Raita. Loads of combinations given here Low Glycemic Index Veg Dinner Recipes. Snacks must be had through the day as you really dont want to be left without food in your bosy. We want to maintian of insulin levles constant when awake and nothing like a healthy snack. Try some Homemade Almond Butter which has good fat and protein and can be carried to work or holidays. Then you can have the Red Capsicum Carrot Apple Juice which is good for your EYES and rich in Vitamin A. Try this Fibre rich Green Apple Papaya Smoothie which will give you sustained energy. Check here for more recipes on Low Glycemic Index Veg Snacks. Always refer to the list of low glycemic index Indian veg foods list to undersand what to eat. 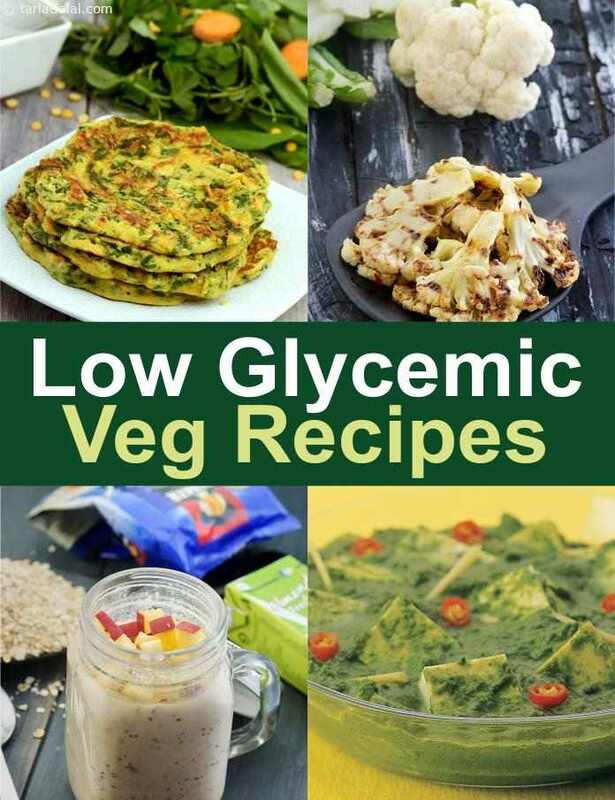 Enjoy our Low Veg Glycemic Index Recipes, Indian Veg low GI recipes and other glycemic index recipe articles below. Fruit and Vegetable Salad with Low Calorie Thousand Island dressing, not just for weight-watchers, but for everybody. This delicious salad also contains all the vitamins A and C needed for the eyes and a glowing complexion. Eating raw fruits and vegetables preserves both fibre and other nutrients.